Encounter the essence of East Bali on this fascinating Karangasem full day tour. Discover fairy-tale landscapes, from lush rice terraces to soaring volcanic mountains. Get in touch with Bali’s spiritual side at Besakih temple and explore rural villages for a chance to connect with the island’s rich culture. Set off for a full day exploring eastern Bali’s many wonders. Start the day with a visit to Penglipuran, a traditional countryside village. Take a look at its neat row of traditional Balinese entrance gates and other unique architectural traditions. 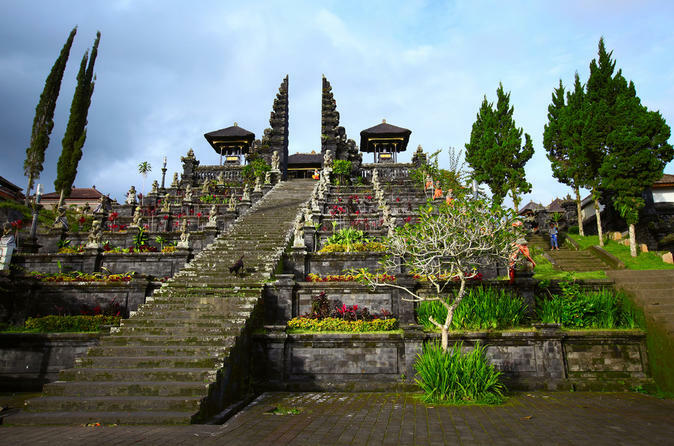 Then drive into the highlands to visit Bali’s Mother Temple, Besakih. Nestled on the western slopes of Mount Agung, Besakih is the island’s most important temple. Take a walk around the site, admiring the 23 separate monuments and learning about Bali’s rich spiritual culture. Break for lunch at Mahagiri restaurant, enjoying a delicious meal while admiring the views of terraced rice fields and Mount Agung in the distance. This afternoon the eastern Bali discovery tour continues with a visit to Sidemen. Take a short walk through this peaceful rural area known for its beautiful landscapes and traditional weaving. Discover miles of green rice paddy terraces and salak (snake skin fruit) plantations. The final stop is Klungkung, Bali’s smallest regency. Take a quick visit to the local market before heading to the historic Klungkung Palace. Discover the elaborately decorated ceiling, incredible paintings and other notable archaeological features of this famous monument while wandering around the temple compound. As the day comes to a close, depart Klungkung and return to the hotel.